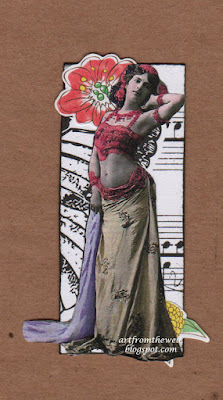 Here is a little "happy" from Michele Storms -- a lovely little "moo" featuring a dancer from my Lunagirl digital collage sheet called Bellydance 3. I like the black-and-white background, especially the music notes, appropriate for a dancer! This is actually Mata Hari -- an image from an antique French postcard, which I tinted with some bright colors. Love the red and how Michele has played with bright shades on B&W.